John Keats’s poetic achievement in a span of a mere six years can only be described as extraordinary. 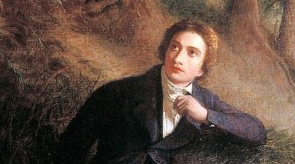 His three books of poetry contain some of the greatest masterpieces in the language, including ‘Ode to a Nightingale’, ‘The Eve of St. Agnes’, ‘To Autumn’ and the sonnet ‘Bright Star!’ Keats’s poetry is now universally admired, but in his own lifetime the critics greeted it with derision. He was born at Moorfields, London, on 31 October 1795 to Thomas Keats, a livery stable manager, and his wife Frances Jennings. He had three brothers, all younger than him: George, Tom, Edward (who died in childhood), and a sister, Frances. Their father was killed in a riding accident in 1804, and their mother succumbed six years later to ‘a rheumatism’ (probably tuberculosis). After seven years at Clarke’s academy, Enfield, Keats was apprenticed to Thomas Hammond, a surgeon neighbour of his maternal grandmother in Edmonton. He began his formal medical training at Guy’s Hospital in October 1815, where he managed to combine his studies with an extraordinary output of poetry. Within weeks of enrolling he was informed that he would be promoted to the senior rank of Dresser from March 1816, thus becoming an Assistant Surgeon at the age of 20. A newspaper report dating from that month reported that ‘Mr. Keats’, one of the surgeons at Guy’s Hospital, had saved a woman’s life by extracting a pistol ball from her neck. 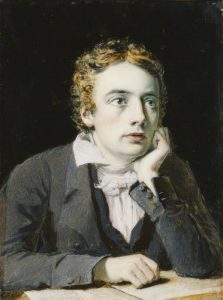 Keats’s first published poem, the sonnet ‘To Solitude’, appeared in The Examiner newspaper on 5 May 1816; the following October he met the paper’s editor, Leigh Hunt, who said he was ‘fairly astonished’ at the quality of Keats’s writing. Hunt’s article, ‘Young Poets’, appeared in The Examiner on 3 December bringing Keats (and Percy Shelley) to wide public notice. His first volume of poetry was published early in March 1817, by which time he had decided to forsake a medical career to get his living by poetry. 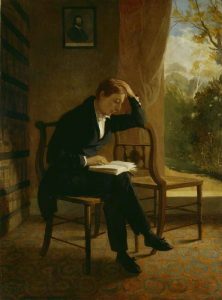 Poems, by John Keats contained 30 poems presented in four sections, and culminated with his ambitious autobiographical poem ‘Sleep and Poetry’ in which he looks ahead to a ‘nobler life’ of imaginative achievement. The book also contained one poem of indisputable genius, the sonnet ‘On First Looking into Chapman’s Homer’. Later that year Blackwood’s Magazine began a series of essays denouncing what it called the ‘Cockney School’ poets and essayists associated with the writer Leigh Hunt, of which Keats was one. Keats’s long ‘poetic romance’ Endymion appeared in April 1818 and fared little better critically than the 1817 volume. Nevertheless, appreciative friends including Leigh Hunt, the critic William Hazlitt and the painter Benjamin Haydon encouraged him, as did his fellow poet John Hamilton Reynolds. In spring 1818 Keats completed his narrative ‘Isabella; or, the Pot of Basil’, and summer saw him make an epic walking tour through England’s Lake District and north into the Highlands of Scotland. He visited Iona and Fingal’s Cave on Staffa, then climbed to the summit of Ben Nevis. Bad weather and poor food took a deadly toll, however, and Keats returned from Scotland with a bad sore throat – arguably the first sign of the illness that would eventually destroy him. By now his brother George had emigrated to America, and his youngest brother Tom was mortally ill with consumption. When he died on 1 December 1818, Keats moved into lodgings with his friend Charles Armitage Brown at Wentworth Place – now Keats House Hampstead. By now, however, there were unmistakable signs that he was seriously ill, fatally stricken with the ‘family disease’, tuberculosis, like his mother and brother Tom. In September of 1820 he sailed for Italy, in the hope that the milder winter weather at Rome would help him recover. An old friend, the painter Joseph Severn, loyally accompanied Keats and was at his bedside when died in Rome on 23 February 1821. Keats is buried at the non-Catholic cemetery in the city. The second half of the nineteenth century brought increasing recognition and, eventually, the fame he had craved. He was praised by Queen Victoria’s poet laureate, Alfred, Lord Tennyson, and inspired many of the Pre-Raphaelites’ poems and paintings. Wilfred Owen’s poetry owed much to Keats, and his influence can be heard in many of Seamus Heaney’s early poems.